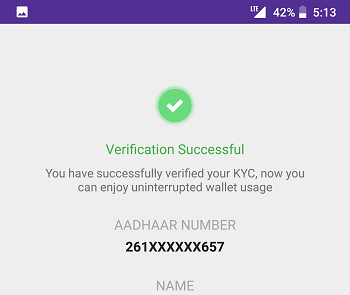 Here we will show you how to complete kyc for your PhonePe wallet to enhance wallet limit and continue services. 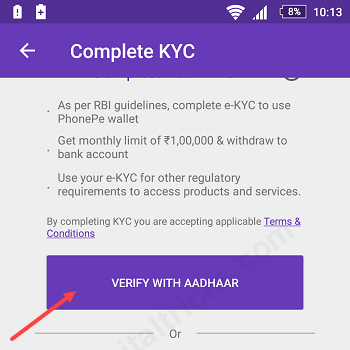 As per recent RBI guidelines, complete your kyc to continue PhonePe wallet for payments and cashback. To transfer your wallet balance to the bank you need to submit kyc details before 28th February. You can also enhance PhonePe wallet limit by completing your e-kyc using aadhaar number. Follow this online step by step process to compete your KYC using aadhaar number. Before you start keep your aadhaar card ready, you need to enter your 12-digit aadhaar number. Second, your aadhaar registered mobile number, you will receive OTP on this number to verify your details. 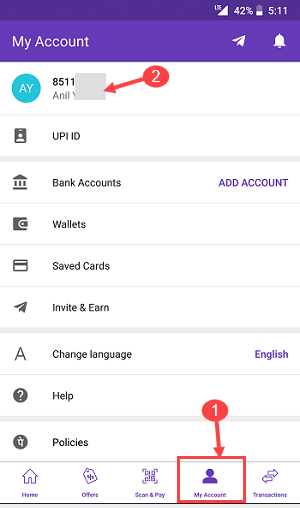 1: First login to your PhonePe wallet and tap on My Account and then profile name as you can see below screenshot. 2: Next screen, you can see “Please complete your kyc” option. Tap on Verify. 3: On next screen select Verify With Aadhaar. 4: Tap on I Agree button. 5: In next screen enter 12-digit aadhaar number and tap on submit. 6: Now tap on Generate OTP. 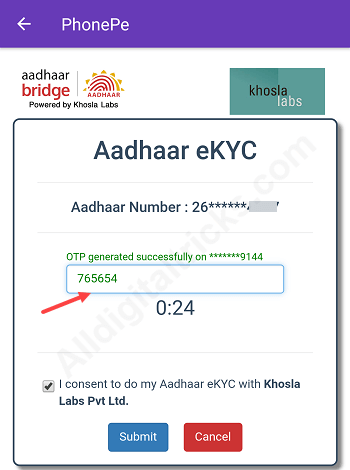 7: You will receive One Time Password (OTP) on your aadhaar registered mobile number. Enter OTP and tap on submit. Done! your e-kyc completed and now you can use your PhonePe wallet without any interruption and also your wallet limit now enhanced. You can validate your kyc using aadhaar card only now. No other document option available. Make sure your mobile number is registered with your aadhaar card to receive OTP. If your mobile number is not registered, please visit nearest kyc center and register your mobile number. 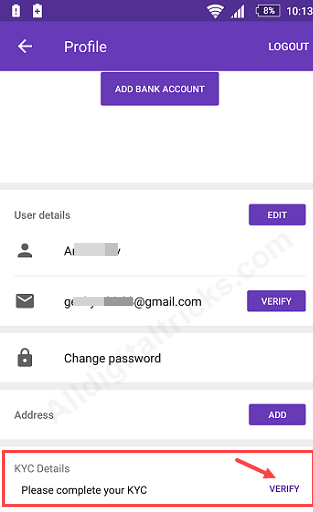 PhonePe kyc still available so complete it as soon as possible. 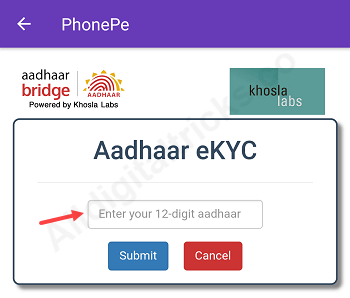 So by following this online process, you can complete PhonePe wallet e-KYC using aadhaar number. Not generated OTP, Showing error in application. Hi it is possible server busy so try again. You can also submit other id proofs. 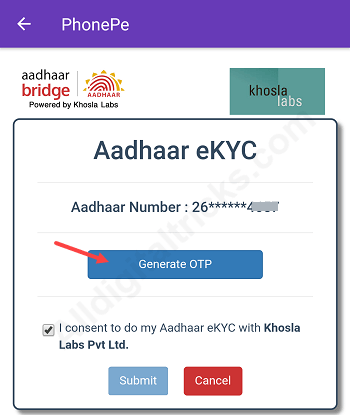 You will receive otp on your aadhar registered mobile number. Plz try again. Please update your phonePe wallet. Tap on my account and then you can see your mobile number. Just tap on mobile number, now see below. You can also see kyc option on home screen. The last date was 28 December. You can still complete kyc of your wallet. Iam not complete kyc my phonepe account still 28 date it’s not showing any notification then what can I do to link my kyc .? your mobile number register with aadhaar? You can also use other ID proof. See there option available. If kyc done successfully then please wait for sometime. I suggest please contact phonepe to confirm your kyc completed. 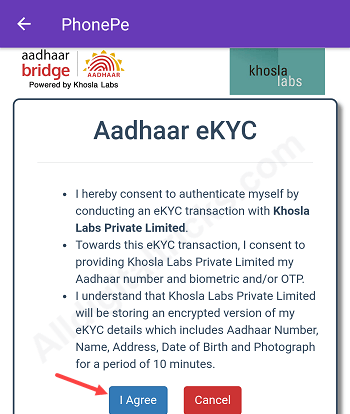 Open phonepe, tap on my account, now tap on mobile number, now see below you can see your kyc submitted. Please try again. It is temporary. In Android version there is no error i can see. Make sure you have updated version. Still i can see it is working fine. Please contact phonepe. I have two phonepe account and successfully completed my kyc on both account. After submitting you can’t change. Please contact phonepe so they will help you. Understand your problem. To complete kyc 28 February was last date as per RBI guidelines. Many wallet companies lost their 50% customers because of this. Please wait for sometime, hope they will do something for those who still didn’t complete kyc. not show kyc option on my phone pe app please tell me what i do. Update your PhonePe App. It is available on Profile section. Please update your version. Tap on my account then tap on mobile number. Now see below, you can see kyc option there. Once they validate your kyc details you can access your wallet. Use help option and message them. I suggest contact phonepe help. Open phonepe and tap on help. Send your message. Are you sure your mobile number registered with aadhaar? If registered then try again. If not received then visit uidai website and verify your mobile number that link or not. Is there any option to verify kyc without aadhaar ? Is there any offline kyc verification like paytm ? Only Aadhaar card valid to complete ekyc, not other documents. Kyc not shown in home screen. How could I update my kyc? Phonepe app do not update. Make sure your mobile number is registered with aadhaar. It’s not supported kyc links. Otp couldn’t give me. .. why? ?? The process is very simple. Make sure your mobile number is registered with aadhaar. On this number uidai will send you otp. You just need to enter this otp and you are done. Please tap on help option and send your query to phonepe.